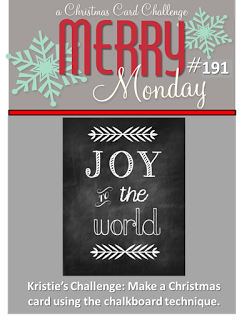 I finally got a chance to participate in another Merry Monday Challenge - it's been a few weeks since I've made a Christmas card and I didn't want to fall behind in building up my stash for next Christmas. The challenge is Chalkboard. 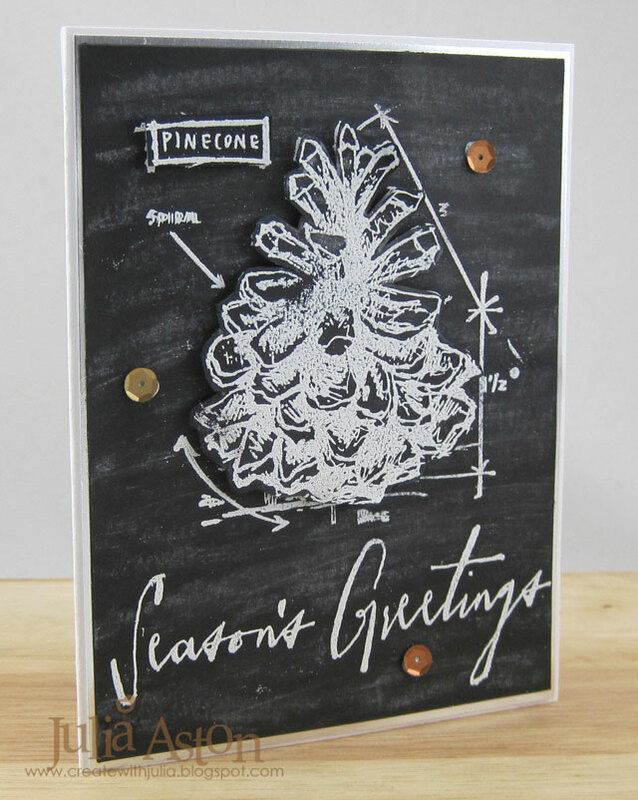 I stamped the Blueprint Pinecone on black card stock with Versamark and embossed it with white embossing powder. I did the same with the Handwritten Holidays sentiment. I scribbled white chalk over the whole panel then wiped over it with a paper towel. I added 3 metallic sequins as a nod to the brown color of a natural pinecone. I layered the chalkboard panel to a silver panel and then to a white card base. Lovely card Julia and I like the added touch of the sequins. Great card Julia. 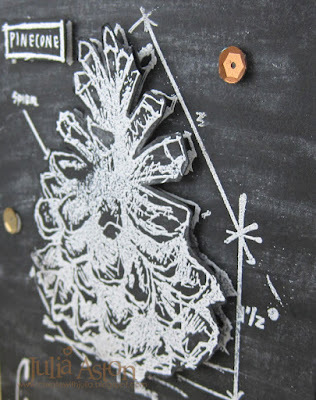 That pinecone is perfect for this challenge and love the idea to add the brown sequins. What a classy chalkboard card! OMG I LOVE this!!! I'll be stealing this......not just casing. Thanks, gf! Wow what a design, looks like you spent a lot of time making it. Nicely done. That stamp is perfect for the chalkboard technique! So happy you played along. So pretty Julia! You rocked the chalkboard challenge! LOVE this Julia! Love the chalkboard technique! This is fantastic, Julia! 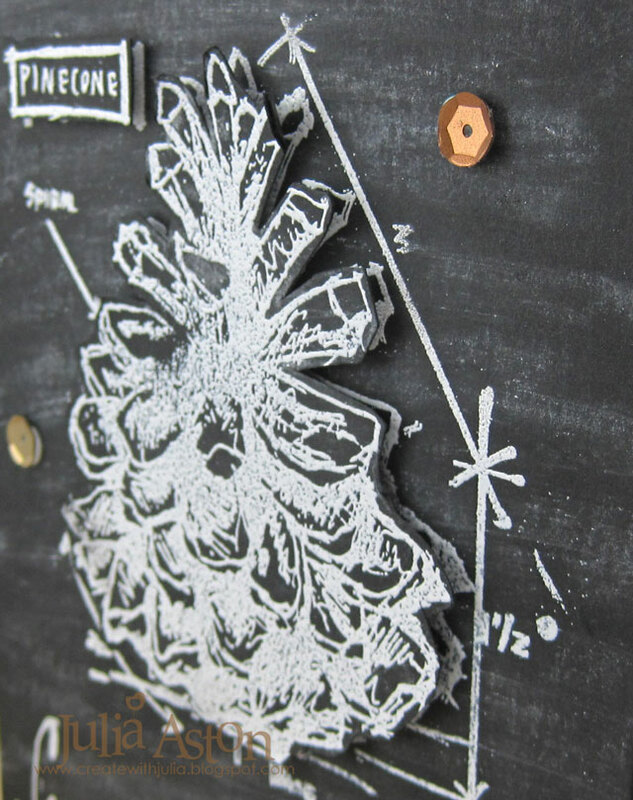 Love the chalkboard design with the dimensional tree! Wonderful Christmas card! Your pinecone is so pretty layered the way you did. I am from the Pinecone state of Maine so I giggled when I saw this! Thanks for playing Merry Monday this week! Oh, Julia - this works so well - what an effective design, really showcasing the stamp beautifully. I love it. I'd say you nailed it! This is the epitome of the chalkboard technique. You've picked the perfect stamp and embellished is minimally, doesn't need anything else. I smell a winner. Julia this is a perfect image for chalkboard, turned out amazing! This card is absolutely stunning! Love the "technical drawing" feel of it. 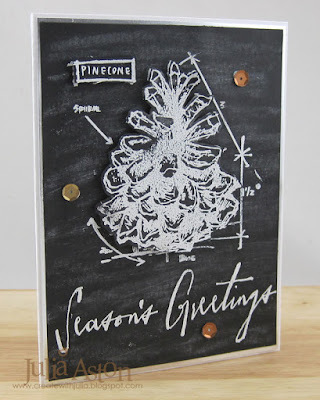 Beautiful card, so unusual and really works with the chalkboard effect. Love this...the layered tree adds fabulous dimension and I love the pop of color from the sequins, Julia! I'm late to say that this is a great chalkboard, Julia! Hope you can bring some berries to Merry Monday next week! Thanks for your encouragement at CAS Mix Up. Hope to see you there too.